I have stumbled across several plants that may or may not be magical but certainly aren't used in Muggle cuisine. Fruit preserve jars contain Crazyberry Jam, Forbidden Forest Blossom Honey, and Marmalade with Orange bits, made by the Hogwarts house-elves, with best-before dates (June in Pisces) on the label. 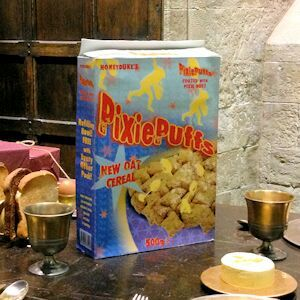 [...] Goodness knows how the students kept their teeth after eating Pixie Puffs (made by Honeydukes), which contains sugar, glucose fructose syrup, African honey, glucose syrup, molasses, magical niacin, iron, fiber, riboflavin, choco, and pixie dust. Some of the non-muggle plants in here are Crazyberries which do not exist in the Muggle world (unless you count the limited time flavor of Pop-Tart which was called Crazy Berry) but I can't be sure that they are strictly magical but this would seem the case otherwise why would they hide them from Muggles (this applies to the next plants as well). Forbidden Forest Blossom honey may be a different case though as it may just be a species of flower that grows in the forbidden forest and is thus too dangerous for Muggles to reach but there's still a chance it's magical. Do Wizarding Photographs Kept in Muggle Homes Violate the International Statute of Wizarding Secrecy?